Earth Links Consulting & Nonprofit Resources | Earth Links, Inc.
At the core of Earth Links’ mission is providing assistance to other nonprofits and community groups, helping them to successfully complete projects they might not otherwise be able to complete. We provide consulting assistance in addition to the material resources and small financial contributions. SRI-grown rice field (left) and conventionally grown rice field, Vietnam. 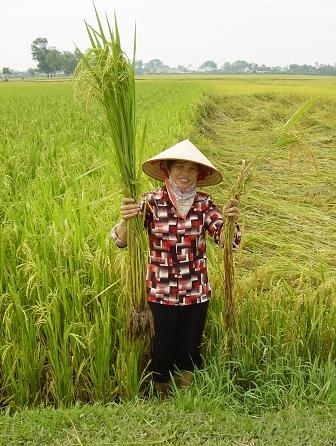 Photo courtesy of FAO’s vegetable IPM program in Vietnam. Nonprofit and NGO formation is something we often participate in, which we feel has great and lasting benefits. We helped to incorporate SRI Global, Inc., an organization we are confident will help in making advances in sustainable rice production. Sometimes our consulting is ongoing and lasts many years. This has been the case with Three Americas, Inc. (formerly the Coalition for Nicaragua). For more than 15 years, Earth Links has offered its expertise to this committed group of activists, who work on social, environmental and economic justice through education projects and fairly traded coffee sales. We helped with the organization’s nonprofit incorporation and have continued to act as a resource to their board of directors in planning, budgeting, and nonprofit management. Other times we may meet once or twice with a group regarding a specific problem or challenge. We often learn important lessons in strategizing for social change from these exchanges and our goal is to capture what we learn and share it with others, especially on our website. Our support services often include photography and media creation. Photography highlights the character and successes of groups and helps them to seek financial support for their work. Our media work often focuses on a point of view and tells a story or highlights an critical environmental problem. We helped videographers Ed Schehl and Katherine Knight produce the documentary “Our Land, Our Future,” about indigenous land rights and environmental issues in Nicaragua. By showing seldom-seen images of the Caribbean Coast of Nicaragua and its indigenous peoples, it helped to pave the way for the Rama Nation in their legal and political struggle to gain the title to approximately 1 million acres of their traditional lands. Earth Links also produced the short film “No Worries For Us” for the Montana Spay/Neuter Task Force, a wonderful group of volunteers who offer education, low cost spay and neuter services with qualified veterinarians, and the means to make community involvement an ongoing effort.